Ticket sales are up at the Playhouse for its panto for a very good reason – it delivers consistently a high quality entertaining show that is for the whole family. Good value for money coupled with a safe, entertaining and funny panto that works for all ages is no mean feat. How many other shows can boast a loud cheer for the arrival of a bench? 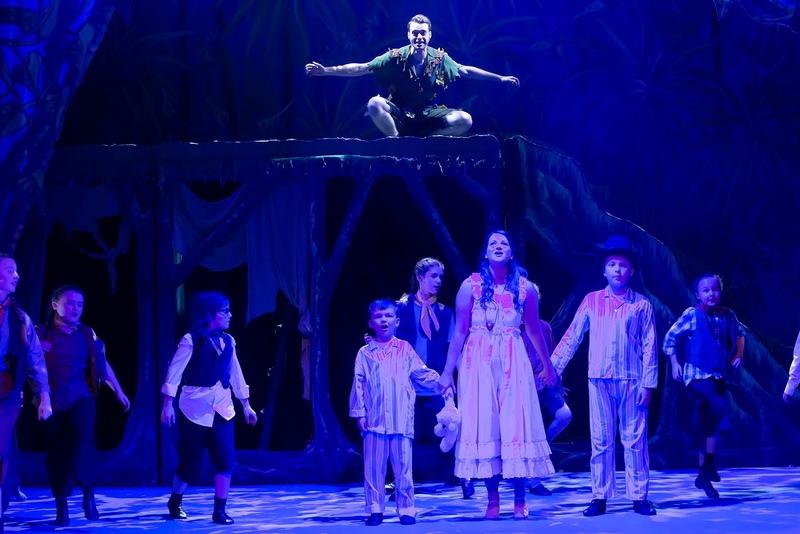 Peter Pan is a show that understands how to get the younger members of the audience involved. Earlier in the week I was at a gig at another venue stood next to the speakers and, trust me, the audience shouts at the Playhouse tonight were frequently louder. 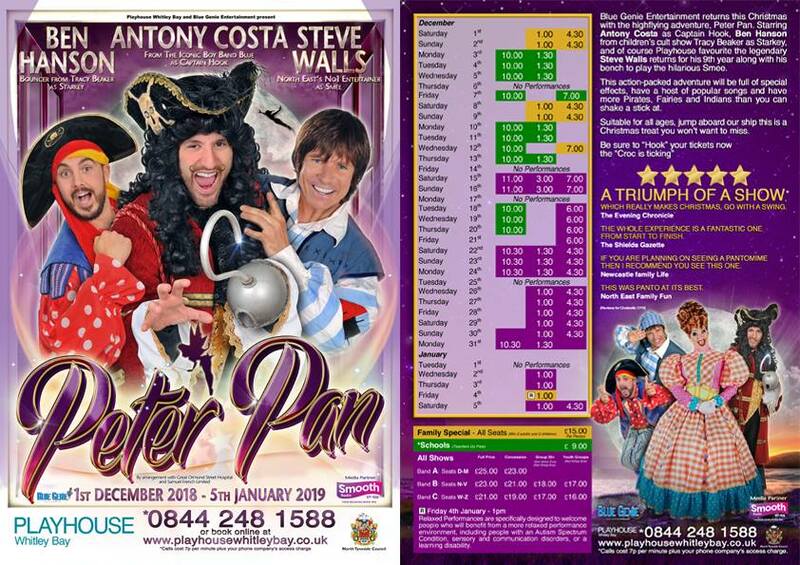 Central to this activity is Playhouse’s regular comic Steve Walls and, surprisingly comfortable playing the bad guy, is boy band Blue’s Antony Costa. Steve is successful at getting the kids screaming their hearts out. 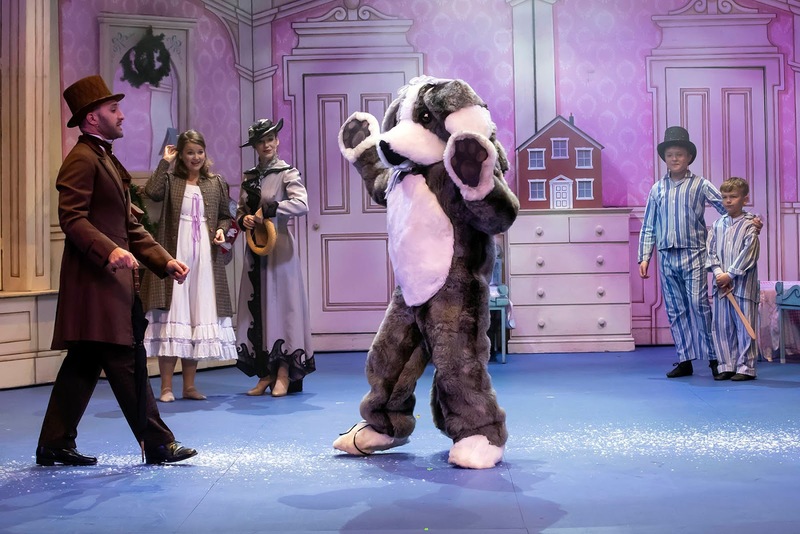 He makes you feel a part of an extended gang – the Playhouse regulars. This is a panto that is happy to reference previous productions. 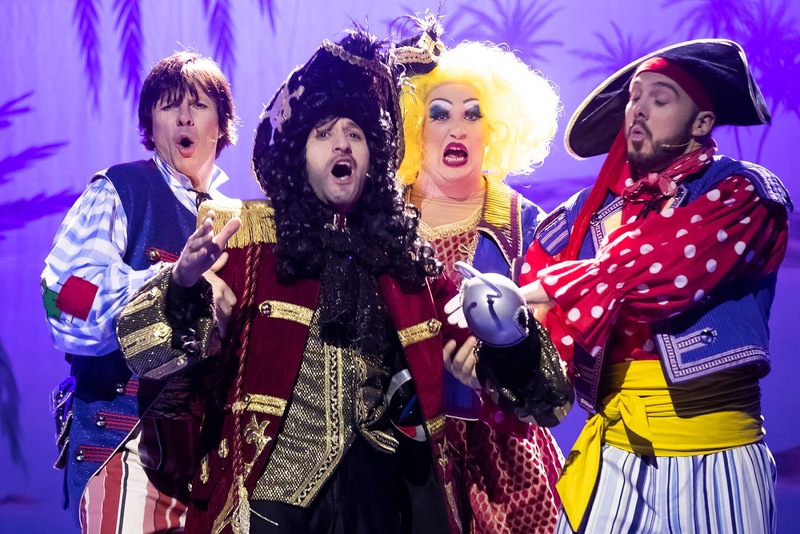 Anthony Costa is unusual – a star name who made his name away from theatre but he understands the mechanics of panto well. Walk on, encourage the booing then deliver the killer line to increase the volume of boos. A panto natural. 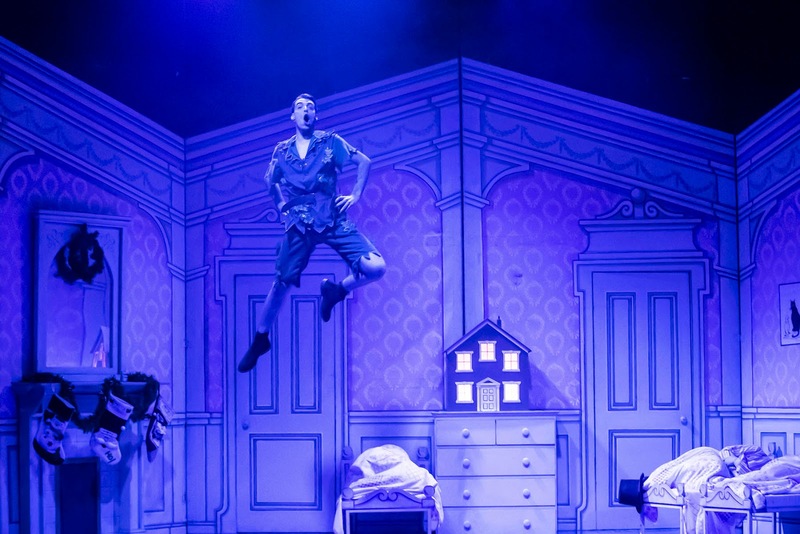 Of course he holds the trump card when the show ends with a Blue megamix that gets the audience off their seats and dancing away like it is 2001. 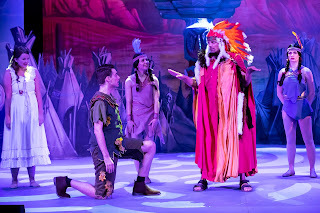 This is also a panto that sticks to the job of telling a story, naturally with a few twists here and there. 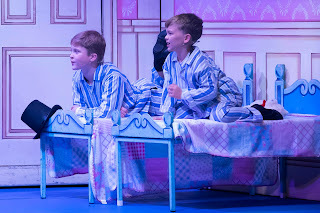 After an opening number which had the Darling children dancing in the streets of London in their pyjamas, Mrs Darling (Sarah Fox) asks Patsy (Daniel Mawston) to get the children ready for bed. This was the only appearance of the acrobatic Nana the dog, which was a shame as it could bust some moves. 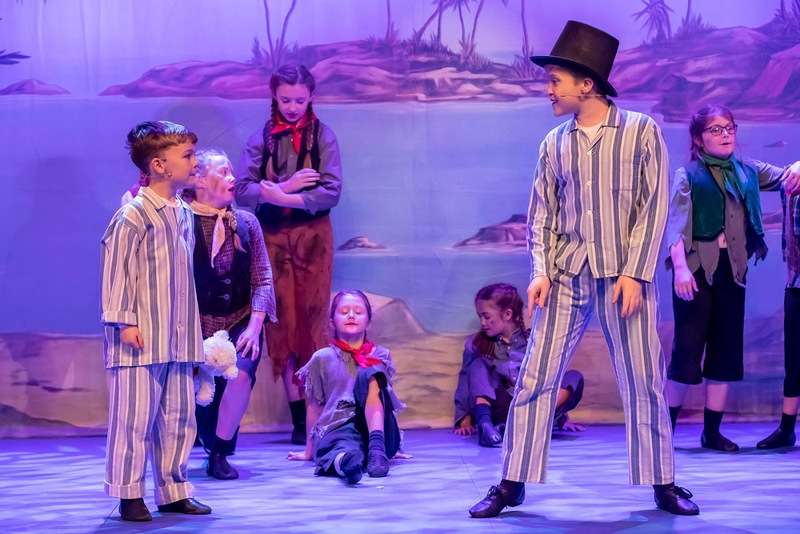 The boys are being rotated between each show and tonight we had the red team comprising of Adam Stephenson as Michael and Reuben Elsworth as John Darling – both lads putting in a performance more mature than their young age suggests. Completing the family set is, of course older sister Wendy – Jessica Pease successfully transitioning from youthful antics at bed time to almost maternal instincts with the Lost Boys. 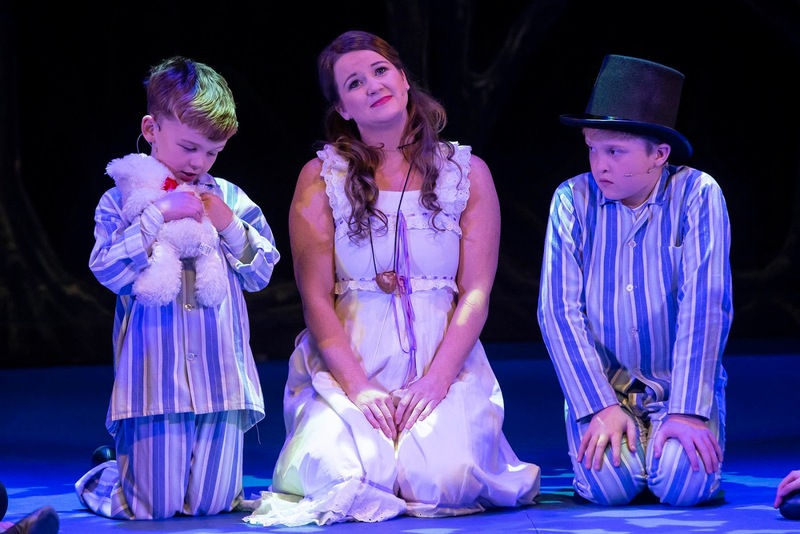 As they sleep, in flies Peter Pan (Sam Ebenezer) – the boy who refuses to grow up. 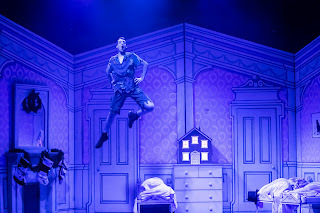 Sam returns to the Playhouse and he keeps his composure as he is suspended above the stage. This is one show that relies on the backstage team heavily and they are kept busy keeping Sam bouncing around. Flyman Ben Straton has his work cut out. 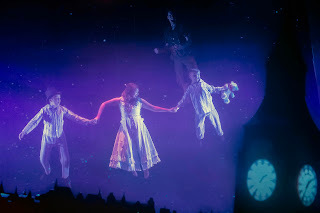 This is a show with a number of projected effects too. 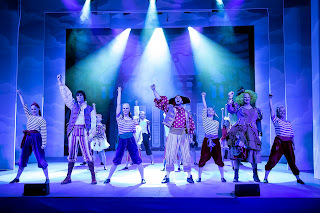 Peter teaches the children to fly and off they go to Neverland to meet the Lost Boys and to annoy the pirates. 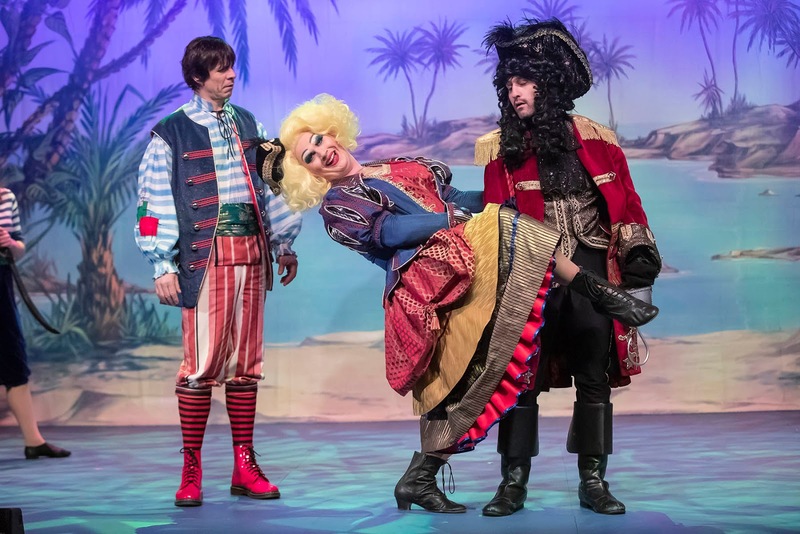 The bad guys are an essential part of panto and Daniel Mawston returns as Pirate Patsy – it is unusual to see the panto dame playing one of the bad guys. She supports the formidable Captain Hook (Antony Costa), his right hand man Smee (Steve Walls) and Starkey (Ben Hanson). 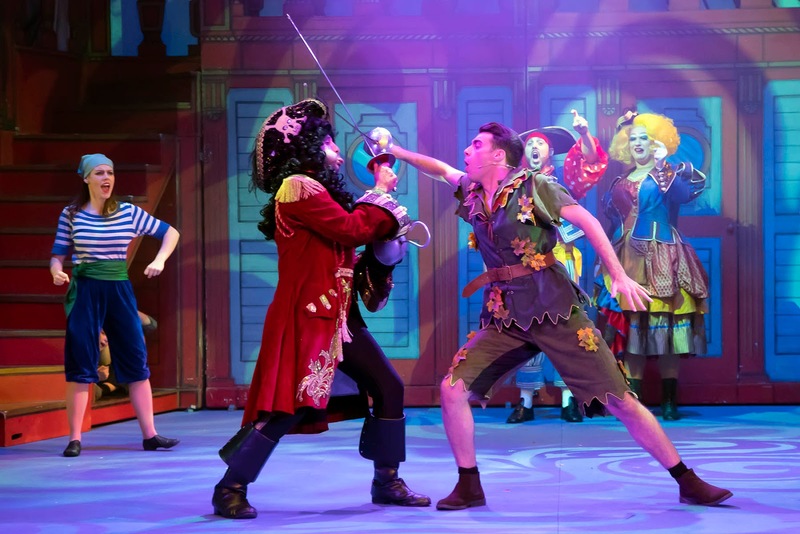 This entourage are out to destroy Peter Pan and they capture Tiger Lilly (Mary J Proud) as snare a trap. Will Peter outwit the crew of the Jolly Roger? 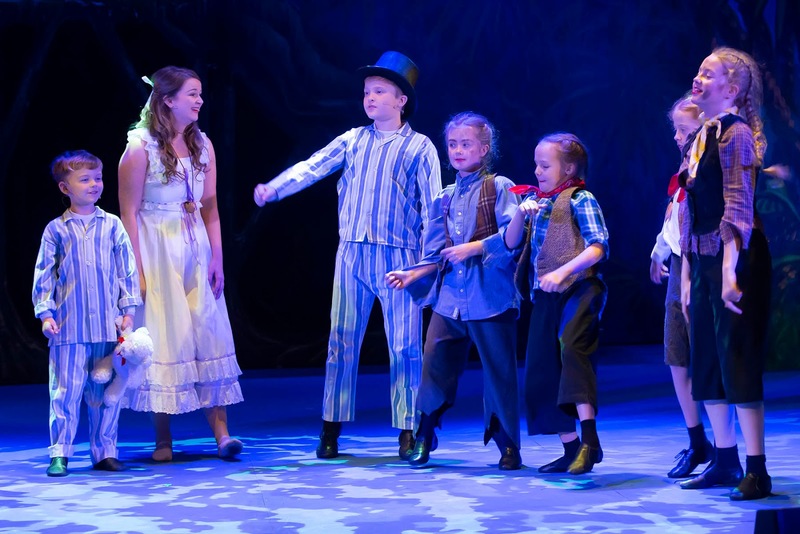 J. M. Barrie’s story is timeless and captures a certain charm. 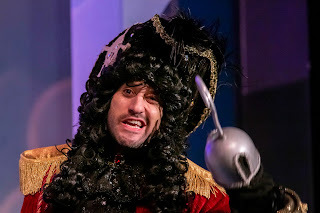 It has been covered by Disney but doesn’t suffer too much with any direct comparisons. Writer and director Paul Ferguson understands the need to not over complicate the narrative and also to stick to it without too many irrelevant diversions. 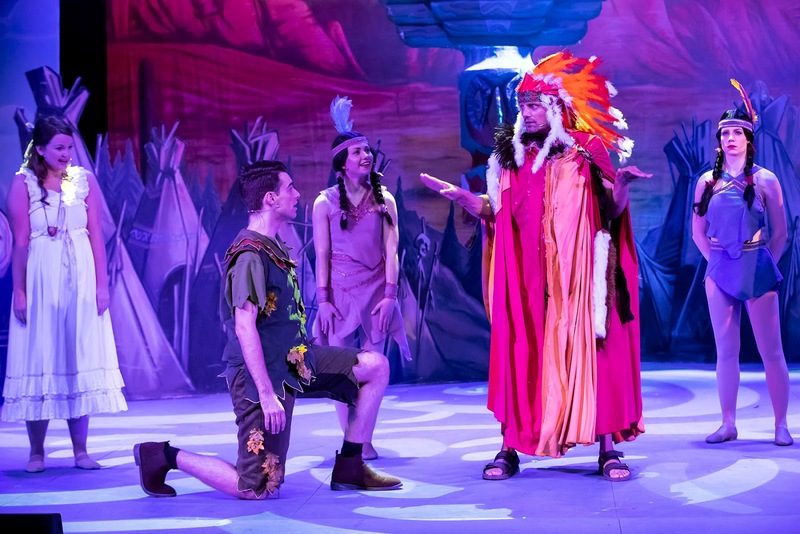 The Whitley Bay panto attracts a younger crowd so the jokes are kept safe, the storyline is kept straightforward and the show sticks to 2 hours plus interval – so it isn’t too long. 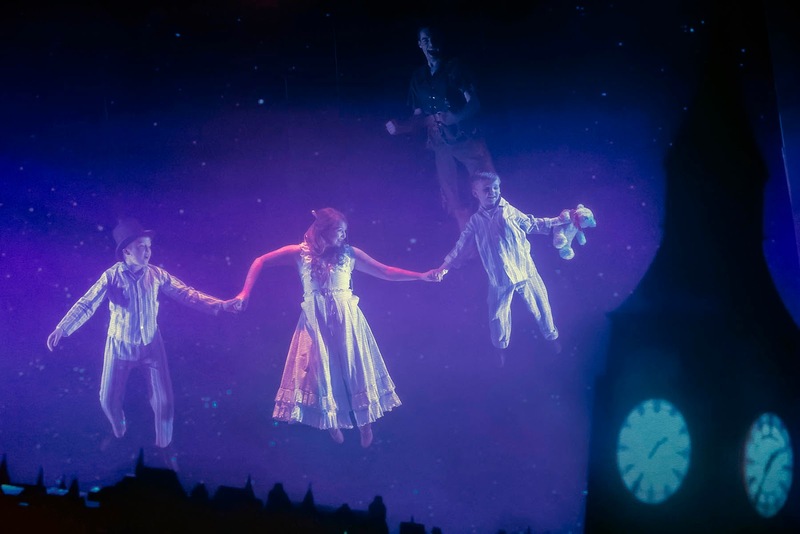 Producer Gary Telfer knows his audience and ensures the show delivers. 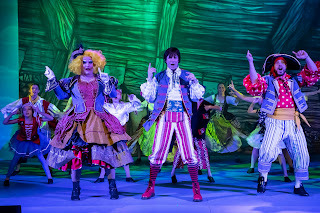 The show has a number of song and dance routines. The songs are more modern than some shows this season and, of course includes that Shark number. 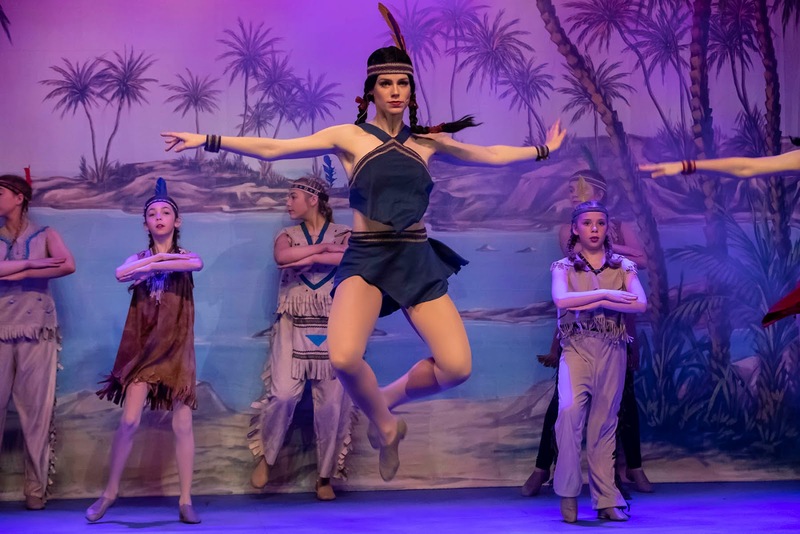 Teams of young dancers, under the careful choreography of Alison Hefferon, fill the stage with colour and energy. Peter Pan is a fun panto that really hit a high gear in Act 2 – the jokes seemed to land better, the audience were louder in their interactions and the bench made an appearance. 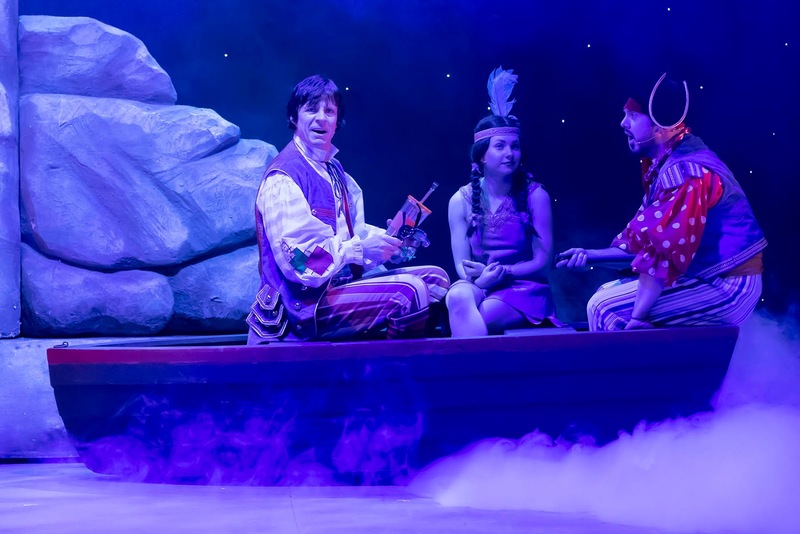 How many shows use a photo of a bench in their social media publicity? 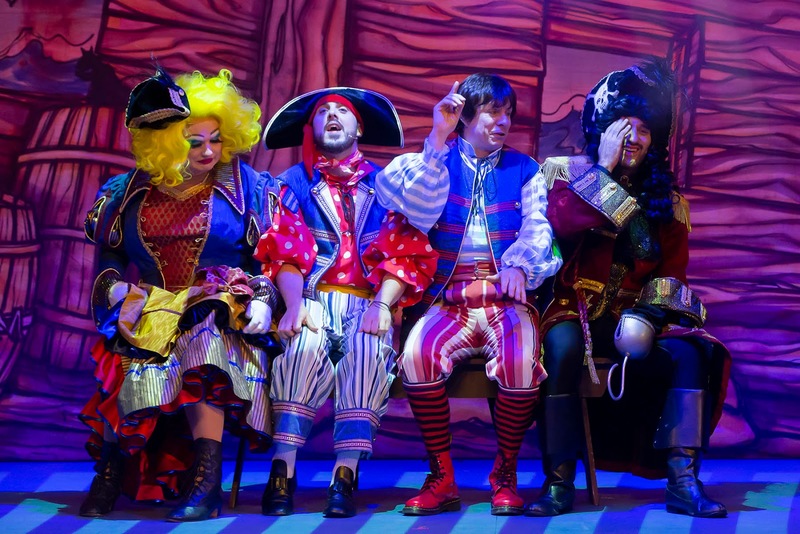 Regulars of the Playhouse panto know that when the bench appears it is time for the classic take off scene. A couple of families left immediately afterwards – had they come just to see the bench and sing Ghostbusters? Whitley Bay, once again, has a good panto with a great cast that set out to entertain the crowd. 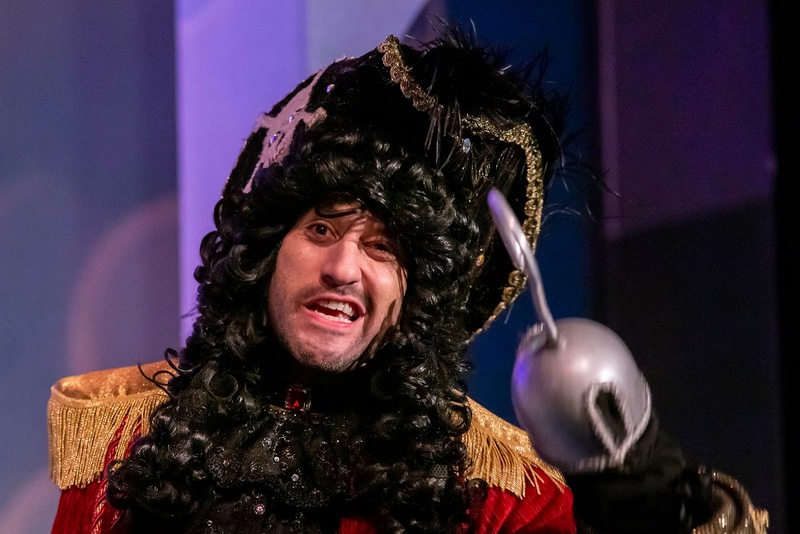 Antony Costa appears to love his role as Hook. 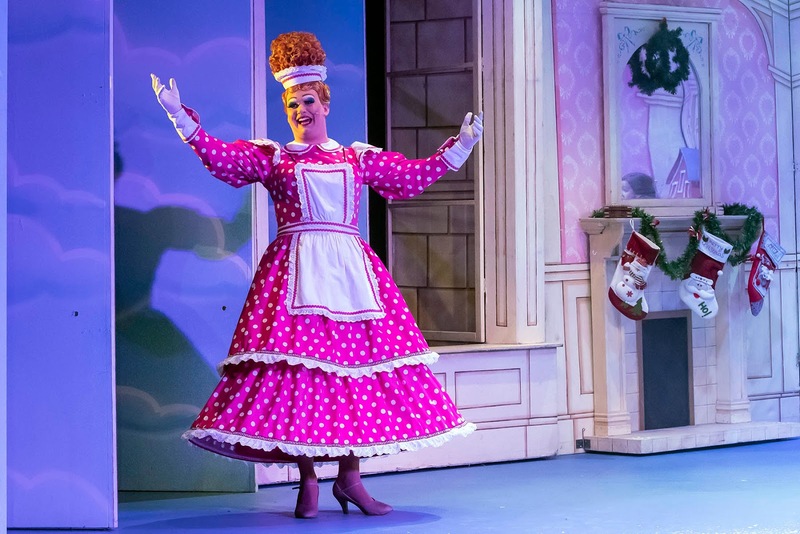 Daniel Mawston plays a great dotty dame, Ben Hanson feeds the lines as the comic’s sidekick and of course comic Steve Walls is central to the heart beat of the performance. 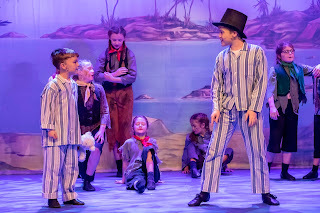 Sam Ebenezer and Jessica Pearse are delightful as the good guys and the children work hard and are charming. 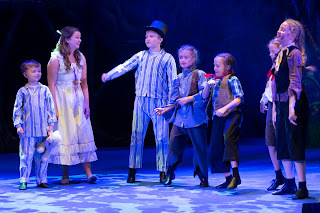 Through in the enthusiastic dancers and we have the makings of a great panto. 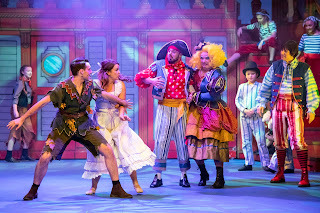 Blue Genie have done it again and pulled off a fun, good value family panto. Tickets start from £15 are on sale now. 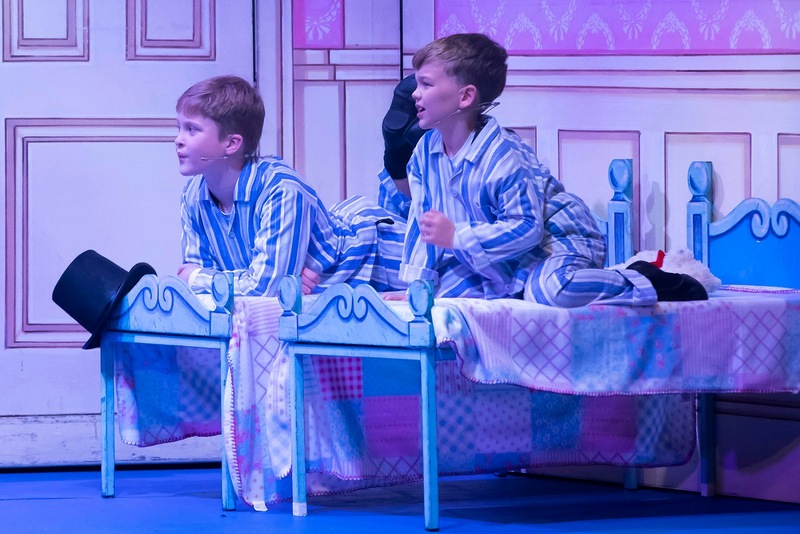 Tickets are available from the Box Office: open Monday – Friday 10am – 4pm, Saturday 10.30am – 2.30pm and until show start on event days. 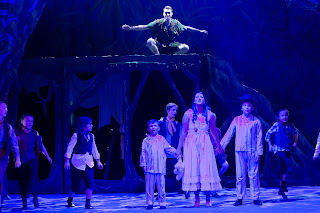 Tickets can also be purchased online from our affiliates Ticketmaster UK http://bit.ly/PlayhousePETERPAN.